Yesterday, I had my first story in the food section of The Philadelphia Inquirer. This was a proud moment for me. Since I moved to the web (this makes me sound like a spider), I haven't written for newsprint. It was gratifying to run my fingers across real ink again. My story on Urban Apiaries, a Philadelphia honey company that bottles by neighborhood, came about via cheese. Three weeks ago, I stopped in to peruse the dairy case at Milk & Honey Market in West Philadelphia and ended up spending an hour talking to the owner, Annie Baum-Stein. We'd been keyboard friends but had never met face to face. 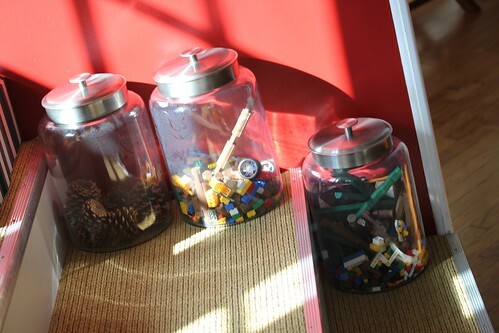 "I have a new project that I'm so excited about," she told me, pulling a jar of honey off a shelf. On the lid was a label printed with her zip code -- the honey came from the hive just above us, on her roof. Intrigued, I whipped out my notebook. Annie's enthusiasm for rooftop beekeeping and her observations about different flavors of honey from around the city were riveting. Later, I muddled over how I would condense our conversation into a blog post. Then it occurred to me: maybe this story was bigger than a post. As a blogger, it's easy to think that everything happens online. But as a former newspaper editor, I remember the thrill of seeing bales of newsprint arrive on street corners and in coffee shops. Yesterday, that pleasure returned when I walked to the corner kiosk and bought a copy of my very own story -- the first printed story about the city I now call my home. One of my favorite shots that didn't make it into the story is this one (below) of Chef Corey Baver in his roof garden above Restaurant Paradiso. The hives aren't visible because they're behind me. I was amazed to taste honey from three different zip codes. Each one was distinct. If you look closely, you can see that the colors are slightly different. The honeys were especially good with local cheese. Sean Faeth (below), of Biba, put together a tasting that I attended for this story. My favorite combination was Birchrun Hill's Red Cat with 19148 honey. But of course. If you live in Philadelphia and haven't visited Annie Baum-Stein at Milk & Honey Market, do yourself a favor. She's on the forefront of food in interesting ways. She also owns Roost, a chiken-and-biscuits delivery service. Last week, I rekindled my interest in Manchego, thanks to some grilled figs and a jar of honey. A friend served this combination at a party, using fresh figs from her backyard tree. Manchego, a subtle Spanish sheep’s milk cheese, was just the right accent, draped over each fig half to form a tiny, briny duvet cover. Manchego is a salty lover. Think of seaside air, perspiring brows. 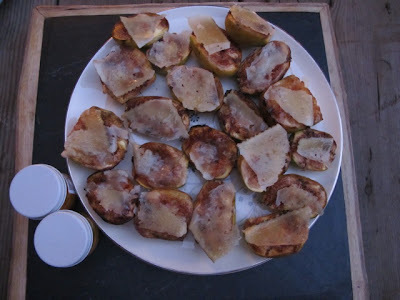 This salinity makes Manchego a fine foil for traditional Spanish sides, like quince paste (also known as membrillo) and Marcona almonds, or cracked green olives plugged with lemon peel. To continue reading, please visit the Di Bruno Blog. Full disclosure: This is part of a series I write for Di Bruno Bros. in Philadelphia. The deal is, I choose a cheese and write a post for their blog. This is how I cover the cost of my dairy habit. How has social media affected cheese? Fromage ($2.99) by Steve Welch offers descriptions of 750 cheeses and a function that allows you to keep notes on each one. One drawback: the design is lackluster and there is a lot of scrolling to be done. Cheese Plate ($2.99) by Chronicle Books is essentially a Janet Fletcher hardcover in app form. The photos are gorgeous, and you can pull up a dozen or so cheese plates by theme, then tap the cheeses to learn more info. Pairing notes, however, are very limited. What I’d like to see: regional cheese apps with interactive cheese maps that would guide users to local cheesemakers and cheese counters. InvestinCheese (@investincheese) delivers daily links and top stories. What I’d like to see: more news from behind the counter. What cheeses are in stock? What cheeses are in season? Why don’t more cheese counters tweet tasting notes? Feeling lost? Don't panic. Over the next few weeks, I'll try to post more about this phenomenon. Until then, here is your assignment: check out some apps, stalk a monger on Twitter, and let me know if you think social media improves your cheese life. For a quick glimpse of cheese talk on Twitter, check out Trendistic. Surely, we can do better than this! Last week, a Philadelphia-area design firm hired me to host a tasting. The theme: Bastille Day. The company: Think Brownstone. The project: Cheese for 40+ people. Should you find yourself playing dairy courtesan to forty-some guests, here is a road map for a rip roaring good time. Many thanks to Phil Charron, a reader of this blog, for dreaming up this collaboration. His follow-up post, which offers a design perspective, ran here. 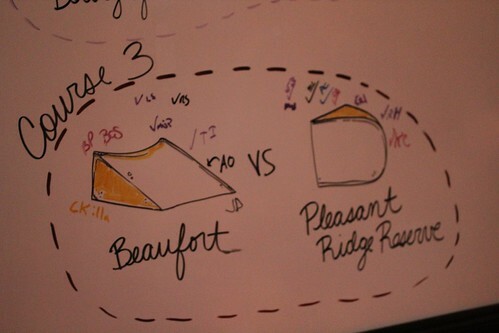 Instead of trying to label every wedge, use a marker and draw a tasting narrative. 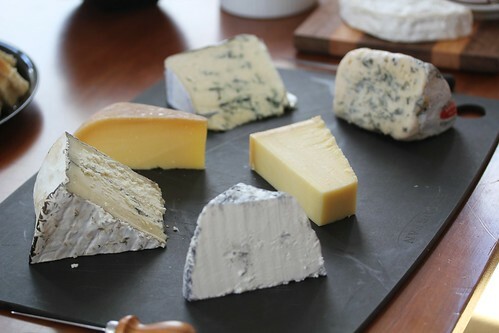 In this case, we planned to sample 8 cheeses over four courses. 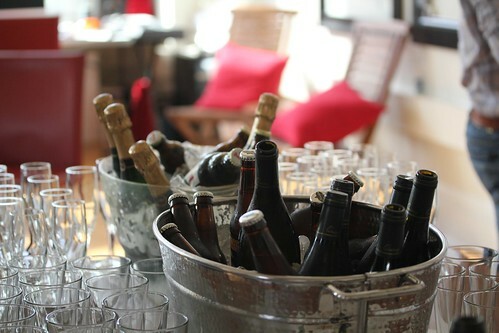 Each course featured a French classic paired with an artisanal American counterpart. Early on, we realized that 40 people hovering around a single cutting board would only lead to cheese brawls. Instead, we designed four flotillas of cheese where people could gather in small groups and walk (swim?) through all four courses together. 3. Start with cheeses that people can relate to. Ultimately, I knew I wanted to lead the uninitiated toward Mecca, in other words, to Roquefort. Real Roquefort. Because I knew that this strong blue would present a challenge for people, I warmed them up with easy breezy bloomies. In this case: Delice de Bourgogne and Moses Sleeper. 4. Give guidance, but encourage discovery. 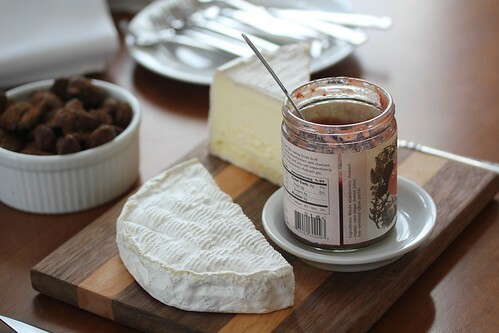 A successful cheese tasting doesn't require handholding. These tasters got very excited over our second course, Valencay and Humboldt Fog. Epiphanies like this are encouraged, but they don't have to happen for everyone at the exact same moment. With eight cheeses, it's easy to get lost. We set up each cheese board so that the French cheeses were in the front, and the American cheese were in the back. That way, each taster could try French Beaufort (middle, left), then take a bite of Pleasant Ridge Reserve (middle, right), its American counterpart. 6. Whenever possible, serve Pleasant Ridge Reserve. People equate American cheese with Kraft Singles, but there are highly sought-after artisanal cheeses coming out of the U.S. Pleasant Ridge Reserve, from Wisconsin, is just that. It's won so many medals that you may not find it unless you sweet-talk a cheesemonger with a very big heart. Do it. The flavor "journey" of this cheese is astonishing -- it lasts longer than Big Red. 7. Don't be afraid to unload the mold. 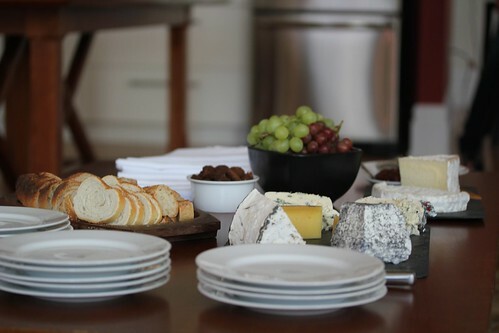 Educate your guests about blue cheese. It's supposed to have those blue crags. That's what gives it flavor. 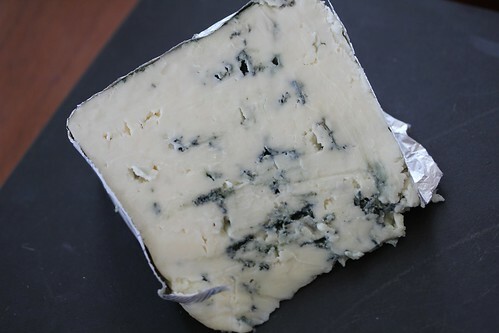 Strong cheese, like this Point Reyes Blue, should never be served as a starter, however. Save it for last when people's palates are warmed up. Then walk them through a bite, preferably with a glass of Sauternes. 8. Sweet wine offsets salty cheese. A lot of people frown at "sweet wine," but it's the perfect foil for a strong character. The Carles Roquefort we served made people's eyes water; one guest described it as "a slap in the face. 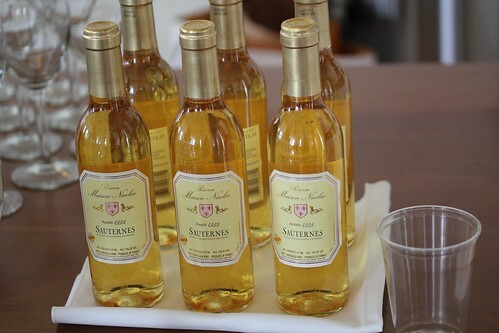 "A glass of Sauternes smoothed out the rough edges and brought out this blue's sweet, mineral-like qualities. The pairing was transformative. I wanted to call this tip "Cheese is Legos." It's true. I believe that, for adults, tasting cheese together is a way to experience play. 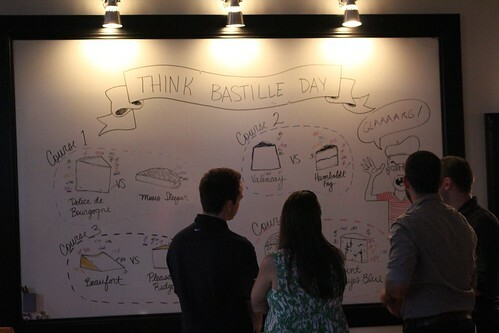 By the end of our Bastille Day party, people were voting for their favorites and reliving their best bites. They were thinking about cheese in a new way. 10. People love participating in food experiences. A beloved writing mentor once told me, "Good writing teaches the reader something new." I think the same can be said of parties. At a smart event, guests are changed. 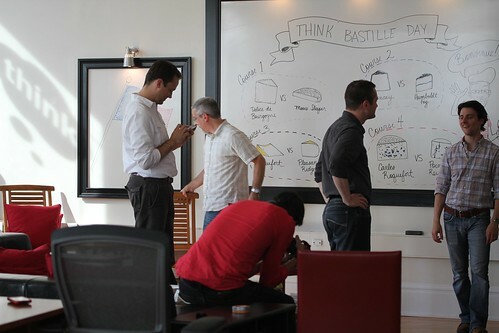 They are moved to eat, draw, discuss, and much later, to relive the joy of discovery. On a hot day, there is almost nothing I love more than retreating to an ethnic grocery to muse and mull. That's how I found myself in a borrowed Volvo, schlepping house guests into Northeast Philadelphia one beastly Saturday to explore Bell's Market. Later, there would blintzes with farmer's cheese and platters of smoked fish -- perfect hot weather fare -- but first, there was the pleasure of oogling a Russian dairy case and marveling at whole smoked mackerel. Bell's Market is in Rhawnhurst, a never-you-mind strip mall community in the hinterlands of Philadelphia, a neo-burb of '60s era twin houses and brownie pan-sized lawns. Right on Bustleton Avenue, the area's main artery, Bell's Market rises from asphalt. Its facade resembles Staples Office Supplies, except for ads written in Cyrillic hanging in the front windows. Inside, the first mission became came clear. Linger by the pickle bar. The woman behind the counter was kind enough to let my friends and I sample her pickled salads. There must have been 50, including three kinds of pickled carrot salad, plus pickle-stuffed peppers and sliced watermelon floating in brine. My favorite discovery was whole pickled apple. It's very delicate and not too puckery, perfect for sharp cheese and smoked fish. From there, I went straight to dairy. Some of the labels made me laugh. And I couldn't get over how many shrink-wrapped, pre-sliced "cheese products" filled the cooler shelves. Certainly an American influence. I cowered. My friend Matt and I were smitten by feta sold in metal canisters. Smitten, but also puzzled. Can metal canisters be good for brining cheese? There was no end to the mystery. There were cheeses of every shape, variety, and nationality. We settled on a few spreadable curiosities and a probiotic cheese that looked especially Soviet. Many of the cheeses in the dairy case were made in Brooklyn, but some were imported direct from the motherland. Really, it was the fish counter that took my breath away. Again, we were allowed samples. How I love women in paper hats. Bell's Market sells both cold-smoked and hot-smoked fish. We learned that cold-smoking conserves moisture and makes for a meatier mouthful. The texture of the hot-smoked fish was thready. And so we went home and feasted. On poppyseed bread, pickles, mysterious beverages malt beverages, cheese, and smoked fish. The bounty lasted for days. Every few hours, someone made a little Russian snack. And the probiotic cheese sat well with us. Imagine cottage cheese with very fine curds. Russians call it "Tvorog." Nestled into a crepe with honey and bananas, it was absolutely luxe. Tvorog, I've learned, is a Russian staple, similar to cottage cheese but more closely related to quark. The blog Everyday Russian offers a recipe for making it at home. It's made with raw milk and sour cream, and unlike ricotta recipes, this one requires no curdling agent (usually lemon juice or vinegar). I can't wait to make some. It’s berry picking season, and that means one thing: cheese and fresh fruit for dinner. I love nothing more than loading up on cherries, strawberries, blueberries, or blackberries and setting out a cheese board to match. Add a plate of smoked fish, a light salad, some white wine, and you’ve got a glorious feast. No fuss. No hot oven. 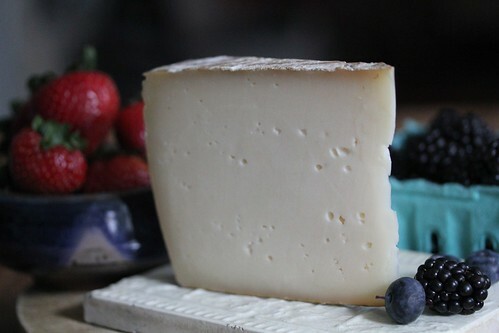 Haystack’s Queso de Mano is one of my favorite summer cheeses for berries. It’s a raw milk goat cheese – very gentle but nutty and herbaceous – from Longmont, Colorado. To continue reading, please click here. This grilled cheese goes out to a reader named Carly, who emailed me from Back on My Feet, an organization that – in very loose terms – sets up solidarity-based running clubs around homeless shelters. A number of my friends are part of this movement. They get up before dawn, drive to a city shelter, and run with whoever is waiting on the porch. The idea is to promote self-sufficiency among homeless men, but the group also serves to generate activism around homelessness and recovery. Since the group formed in Philly back in ‘07 – thanks to a lone runner named Anne Mahlum -- chapters have popped up in other cities. Boston, Dallas, D.C. If you see someone running in pajamas this weekend or a group of runners who glow in the dark, it’s all part of the group’s fundraising relays. All weekend long, their 20in24 events will be underway around the Philadelphia Art Museum. Since Stroehmann’s Bread is the event sponsor, I accepted a loaf and made this sandwich. I wanted to choose an appropriate cheese – something with a little oomph, a wedge with attitude. I considered Pondhopper, for the name. Then, I thought about cheeses that smell like feet. But that didn’t bode well. After much mulling, I chose a cheese with chutzpah, a spicy puppy called No Woman, from Beecher’s Handmade Cheese in Seattle. No Woman, named after the Bob Marley song, is a sharp cheddar laced with jerk spices. Add a shmear of sundried tomatoes, and this grilled cheese sandwich is sweet and spicy. Imagine a few reggae beats as you bite in, and you may feel the call to start running. Cheers to Carly and everyone out at the Back on My Feet relays this weekend. 1. Make a sandwich of sundried tomatoes and sliced cheese. 2. Add olive oil and butter to a hot skillet over medium heat. (The olive oil will keep the butter from burning). 3. Fry up sandwich. You may want to cover it so the cheese melts. 1. I beheld the Cashel Couple. Here they are, Sarah Grubb and Sergio Furno, makers of Cashel Blue, a cheese so sumptuous it should be called frosting. Sarah's mother invented the recipe, and now Sarah and Sergio have become dairy olympiads; they won gold at the World Cheese Awards in 2006 and 2010. Big fat gossip: Cashel Blue has been picked up by Kerrygold, (the Irish butter butter magnate), and I expect there'll be a wild marketing campaign. I hope. If only all the butter lovers would learn to embrace blue cheese. Pssst...Cashel is great for shmearing on bread, on oaty biscuits, even wrists. 2. I tasted the Lord of Hundreds. My new favorite cheese. Look at the rind. This ewe's milk dream is so pretty, it has a manager, the lovely Ann-Marie Dyas of The Fine Cheese Co. in Bath, England (she's also a judge at the British Cheese Awards). You probably know the crackers made by this company. They seem to worship cheese through their very packaging, and Ann-Marie was no different. She had me laughing about a cheese named Rachel -- after the cheesemaker's girlfriend, now his ex. She showed me his picture, then scuttled under a table and dug out some quince caviar for an impromtpu tasting. 3. I glimpsed Paula Lambert. But I didn't get a chance to chat. 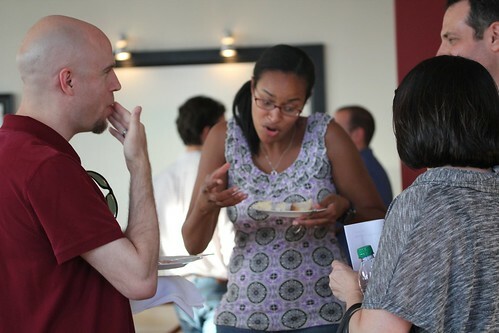 She was elbow-deep in fans, sampling her goat cheeses from Texas. Paula is a pioneer. She began making cheese back in the '80s and is known for bringing the first real Italian mozzarella to Dallas. She simply made it herself. Look at this spread. I still fantasize about Paula's Hoja Santa, a leaf-wrapped muffin that once appeared before me on the cheese cart at the Four Seasons. 4. I sampled Sgt. Pepper. Mary Keehn of Cypress Grove Dairy in California has a new line of "flashback" goat cheeses that call to mind Ben & Jerry's. Rolled in four kinds of pepper, Sgt. Pepper has a trippy look to it and tastes like just the sort of cool, fresh bite you'd want on a roadtrip. It was positioned next to four other flashbacks, including PsycheDillic and Purple Haze. 5. I met a bicycle enthusiast who makes cheese. Alan Glustoff from Port Chester, NY makes great raw milk cheese with some interesting branding. At 5 Spoke Creamery, he brings together wheels and wheels -- think cheese, then bicycles -- to promote the simple pleasures of eating and sidewinding. I'd never tried this rustic number (and I'm embarrassed to say, I forgot its name), but I left the booth curious to try more. Luckily, I see its available at Philadelphia's Essene Market. 6. I discovered my first Puerto Rican cheese. 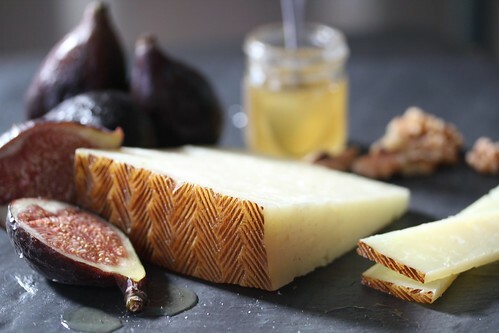 Quesos Vaca Negra claims to be the first company to produce aged artisan cheese from Puerto Rico. I believe it -- I was there in January and couldn't find a single local variety at the market. Cheesemaker Wanda Otero studied cheesemaking in the U.S. and now produces 5 cave-aged cheeses. It will be interesting to see how her new business progresses. This is her first year. 7. I tried all of Rogue Creamery's blues. I've been such a fan of Rogue River Blue, and I had no idea that this Oregon company produced a whole line. Their newest, Flora Nelle, tastes like pecans. It's sharp, sweet, nutty -- just wonderful. It's also the company's first pasteurized blue. This surprised me. Overall, pasteurized cheeses in America seem to be gaining complexity. What's the secret? 8. I spent five hours feasting. I couldn't believe the array of cheeses, the coolers full of wheels, the generosity of so many makers. I can still taste some of my favorites. Like Kunik. And these tiny hand-made cheeses, called Hannahbells. They look like gumdrops and taste like marshmallow morsels. And these succulent gems, from Vermont Cheese & Butter Co., where I met the oh so lovely Adeline Durant. My photos are a bit blurry. You can tell I was hurrying to maximize every mouthful. I was so happy to see Saxon Creamery, too. They make one of my favorite wheels from Wisconsin, Big Eds. And that was all I could stomach. Now the countdown begins for the American Cheese Society Conference in Montreal, Aug.3-6.